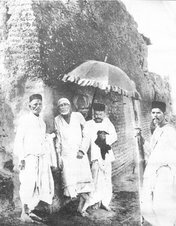 Until now there have been few posts regarding the sacred text Shri Sai SatCharitra. Somehow I had been away from reading the invaluable scripts of the blessed book,since last couple of months. Started reading it and completed the reading in front of Sai Baba's pictures in my room in three days. Today on Thursday will start it again. Certainly it always helps a lot. Within these two days also herd about book's power to take away the burden. Sai Baba has made contacts with few local devotees with me. 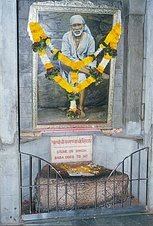 One of the devotee is always running for any work related to Sai Baba. 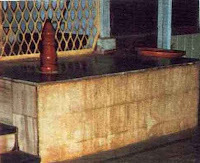 It may be getting all the Aratis performed in Marathi Language as performed in Shirdi, helping the poor and needy, giving panchamrut bath to Sai Baba idol in morning, on Thursdays if not not every morning, attending the Aratis and so on. 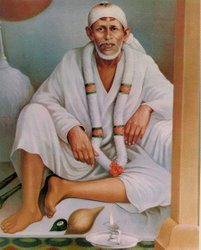 He also suggests the reading of Shri Sai SatCharitra or getting the saptah (reading the book in a week, preferably starting the reading on Thursday and completing on Wednesday) and perform Sai Baba's Arati after the reading is complete. 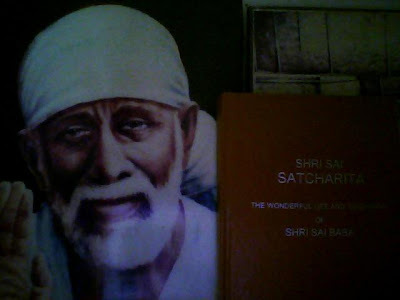 As i have stated earlier on this blog, i always keep few copies of Shri Sai SatCharitra with me and recommend and give them to people looking for one or when i feel like giving one to a particular person. This Sai Baba devotee, whenever he has to give Shri Sai SatCharitra, he comes to my home and give it or send it to whom he has to send this sacred text. Few days ago he suggested and sent Sai SatCharitra to a family living in Ahemedabad, who were living in rented home and required a home they owned, and need a son. The devotee and friend of mine suggested them for a Saptah of Shri Sai SatCharitra. It was done and they were too happy to call my friend that they got a deal done for their own home on Thursday. Below is another incident about Shri Sai Satcharitra, the kind which has been making deep impact on the writer. I have started teaching Martial Arts Classes to the senior belts practitioners and instructors here in Surat. Last Sunday i watched a instructor who normally moves with full force was not moving the way he should while performing the kicks. I asked him to move totally with all the energy he has and with all the body participating in the kick and not just his legs. He said that he had pain that stopped him from doing so. When asked where the pain was he showed me lower spinal chord area. I asked him to stop practicing immediately and watch and learn for that day. Normally in Martial Arts training the physical fatigue and pain has to be overlooked and practice continues so that the body and the system gets stronger in that manner. Here it was a case of injury, where this rule does not apply and rest and medication if required are the first thing to do for injuries. And the injury of the vertebrae column has to be taken seriously. I told him and all the students never to take this injury lightly and doctor has to be consulted as soon as possile, avoiding any physical strain. Next day when i went to see a Tae Kwon Do class he runs, he told me that he was glad that i asked him strictly to see a doctor. There were two gaps and a months bed rest was advised. First i had to scold him not to follow the advice and taking it lightly, as he was not at home and teaching Tae Kwon Do instead. Next day he was suppose to hand over his classes to other instructors for a month and take complete rest. As, i was sitting a thought crossed my mind how will an active young guy spend his time in bed for a month. A tough job indeed. So i called him up and called him at my home. He came after some time. I gave him Sai Baba's Udi packets. On seeing the packets he said Oh Sai Baba's Udi, thank you sir. I have deep regards for Sai Baba. i advised him to drink it water daily and apply some on forehead and injured area. i said that's nice to hear for what i am about to tell you. My other hand had Shri Sai SatCharitra which i bought in front of him. i said this is Sai Sat Charitra. He would not let me continue, his voice was chocked, his body trembling slightly. With chocked voice he said to me, 'Sir, something is happening in body, all the hairs on my body are standing on their ends.' He showed me the erect hair on the body twice by putting forward both his hands. 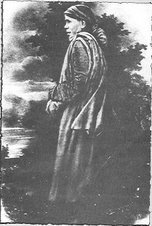 He continued, 'Sir, i cannot explain what is happening within, i have not even touched the book.' i could listen to the invisible gratefulness in his voice, the subtle happiness flowing from him. i told him, 'look i need not tell you more, Sai Baba himself is making you feel about this book. I will tell more about the book later as i need not interfere in the feelings Sai Baba is giving you through this book. 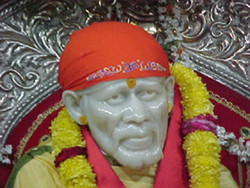 In fact don't treat this as a book, but Sai Baba himself, treat it as Sai Baba's love and grace. 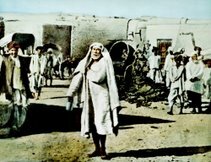 It is not only the life of sai retold but the life of living sai who will appear in each and every word. 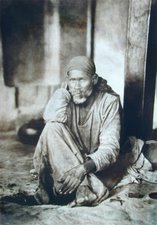 It is very true Sai talks to all through his charita as he has assured that he will be ever living and ever protecting his devotees. 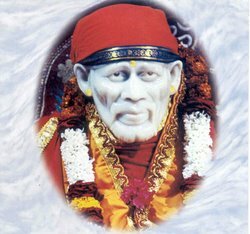 If sai wants to go to some he will....and if people read his charita then he will never leave them.